Seasonal Hearth: Tasha Tudor Day~ Take Joy! Tasha Tudor Day~ Take Joy! all-day Tasha Tudor celebration to remember the very special and inspiring woman whose illustrations grace the pages of many books, some of which she has written herself. 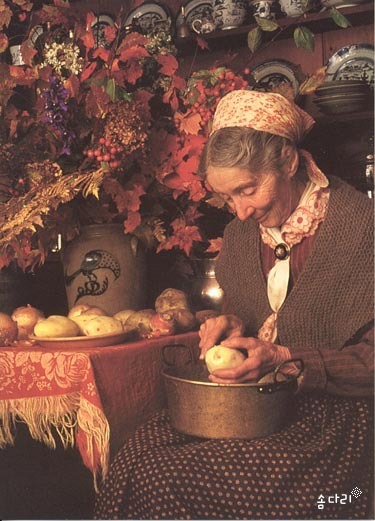 I am joining the many fans of Tasha Tudor by celebrating her life; the quiet, gentle, simple life she led as depicted through her books and illustrations. "From a young age Tasha Tudor was interested in the home arts. She excelled in cooking, canning, cheese-making, ice cream making and many other home skills. As anyone who has eaten at Tasha Tudor's would know, her cooking skills were unsurpassed. She collected eggs from her chickens in the evenings, cooked and baked with fresh goats milk, and used only fresh or dried herbs from her garden. 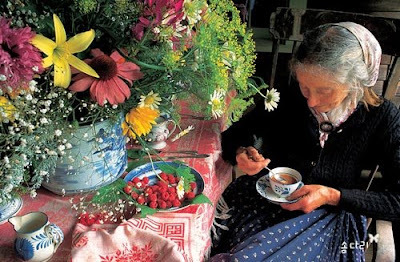 Tasha Tudor was renowned for her Afternoon Tea parties." You can read more about her life as well as her books here. "I enjoy doing housework, ironing, washing, cooking, dishwashing. Whenever I get one of those questionaires and they ask what is your profession, I always put down housewife. It's an admirable profession, why apologize for it. You aren't stupid because you're a housewife. When you're stirring the jam you can read Shakespeare." My celebration began this morning with the gathering of all my books, both library and my own collection, to set up a book display. There is a very special story behind this cookbook. My dear friend Liz spent time this summer with her family in PEI. While there she spotted this cookbook in a shop. It made her think of me because she knows how much I love Tasha Tudor, so she bought it. I came home from work one day recently and there, on the bench in the hallway, was a lovely package...inside was the cookbook. I was so blessed and touched by her thoughtfulness. Thank you Liz! I spent time this past week browsing through it again, trying to decide which recipe I would use for the tea I was planning to serve to my guests this afternoon. Our dear and special friends from Hamilton, H&M were set to arrive for lunch, so I was up early to get the day started by baking and preparing for the luncheon. I know that H loves gingerbread, so when I came across this recipe, I knew it was perfect for afternoon tea. Preheat oven to 350 degrees F. Grease 2 iron cornbread pans (12 pieces each) or, if you do not have cornbread pans, 2 9 x 9-inch square cake tins. In a large bowl, cream together the butter and sugar. Add the egg and the molasses, then sift in the dry ingredients and mix the batter well. Add the hot water and beat until smooth. Stir in the raisins. Fill the prepared tins or pans half full, place them in the preheated oven, and bake the gingerbread 25 to 30 minutes, until done. Makes 24 servings. Serve warm with whipped cream or vanilla ice cream. Since the recipe called for farm-fresh eggs, I paid an early morning visit to our faithful and dearly loved hens to see if they had some eggs to share with me. Although some of the hens were still busy, I gathered the available eggs and brought them in. There is truly nothing like farm-fresh eggs and I feel so blessed to be able to have chickens/hens. I wish I could say that these lovely loaves of bread came out of my oven...they would have been just the loaves that Tasha would have served as they are called multi grain rustic hearth bread. Don't you just love that word hearth? It conjures up images of heart and home. Tasha was known for her rustic bread which she produced in her own open hearth oven. After a lovely lunch of salads and these rustic loaves of bread, we spent a relaxing afternoon on the back deck and in the pool. At tea-time I went indoors to make the preparations for our Tasha Tudor tea, then called everyone in. We all agreed that the gingerbread cake was very good and the recipe is definitely a keeper. I always associate gingerbread with Autumn or Christmas, but it is just perfect for any time of the year. ~her expressions including: Take Joy! and Take Peace! "Life isn't long enough to do all you could accomplish. And what a privilege even to be alive. Supposing you only saw the stars once every year. Think what you would think. The wonder of it!" "I salute you! There is nothing I can give you which you have not; but there is much, that, while I cannot give, you can take. No heaven can come to us unless our hearts find rest in it today. Take Heaven. No peace lies in the future which is not hidden in this present instant. Take Peace. The gloom of the world is but a shadow, behind it, yet, within our reach, is joy. Take Joy. And so... I greet you, with the prayer that for you, now and forever, the day breaks and the shadows flee away." Take Joy! my friends, take joy!